As technology advances, gadgets and gizmos are becoming smaller and smaller. From medical devices to bee-sized robots, developments in engineering have made for incredibly tiny electronics. To accommodate these diminutive devices, researchers at Harvard University and the University of Illinois at Urbana-Champaign have successfully 3D printed lithium-ion batteries the size of a grain of sand. 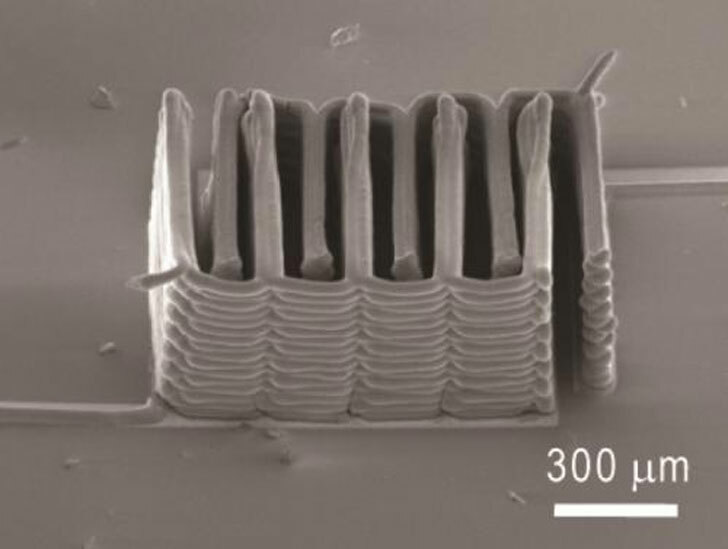 They were able to use a printer to fabricate interlocking electrodes each about the width of a human hair. Their results have been published in the June 18 edition of Advanced Materials. The batteries needed to power these tiny electronics have tended to be too large to accommodate their structures. In the past, scientists resorted to depositing thin films of solid materials to create electrodes but found that the techniques could not supply enough energy. Using a 3D printer, the team created an “ink” that was able to both exit the incredibly fine nozzles on the machine and harden the moment it was deposited. The inks consisted of electrochemically active materials could form anodes and cathodes. The ink for the anode and cathodes consisted of different types of a lithium metal oxide compound. Each was layered onto the teeth of two gold combs, creating a very small interlacing stack of electrodes which were then packaged into a container and filled with an electrolyte solution. After measuring the amount of charge, life cycle, and energy rate, the researchers found that the micro-battery was comparable to commercial batteries, but much smaller. Jennifer Lewis, Ph.D, who was the lead author of the study, was responsible for much of the battery ink designs. “Not only did we demonstrate for the first time that we can 3D-print a battery, we demonstrated it in the most rigorous way,” she said. The advancements could potentially transform not only the way in which batteries are produced, but their overall size and application. Practical applications we can implement these new 3D printers are only limited by our imagination. Thanks for sharing.